Released in 1981 Eyes of a Stranger was released during the height of the popularity of the slasher film and apparently this was originally intended as a thriller, but due to the popularity of the slasher film at the time it was decided to play up to slasher conventions a bit more and what we get is a film that at times isn’t quite sure exactly what it wants to be and some scenes are very much slasher film 101 and other scenes play more up to thriller conventions. Films like this were fairly common to some degree in the early part of the 80s (as well as the late 80s) with films such as 10 to Midnight and Silent Rage also adding slasher elements, but Eyes of a Stranger plays up to the slasher formula a little bit more than the two films mentioned. Eyes of a Stranger is fairly successful in the mixture of slasher and thriller, but it can also feel a little disjointed in spots as well. Eyes of a Stranger was long OOP and while the film had a cult following it was also semi-forgotten. Tom Savini who did the make-up F/X had most of his gore trimmed for an R-rating, but in 2007, Warner Brothers released the film on DVD and despite the R-rating listing it does feature the gore that was cut from the theatrical release. However if you go into the film expecting a gory slasher film you might be a little letdown. 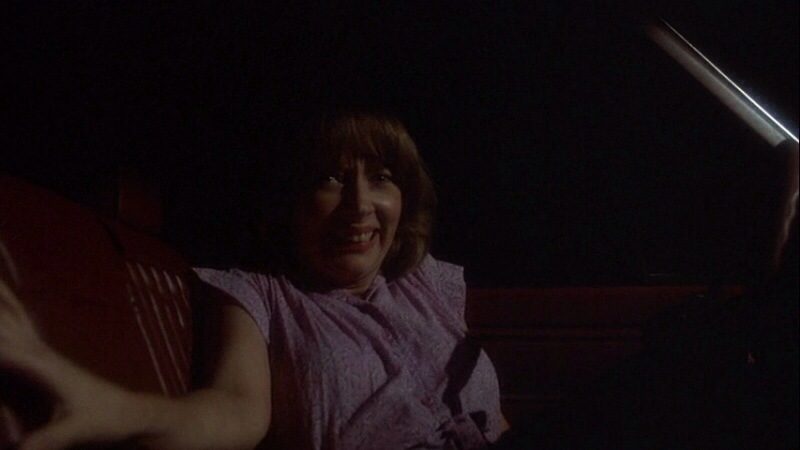 The gore scenes while terrific aren’t any more graphic than your standard R-rated film perhaps even at the time (the MPAA was very odd with their ratings in this era). While the film has moments like Halloween or any other slasher film of the early 80s it also doesn’t exactly follow the formula. If anything think of this as something like Maniac. While the two films are totally different they’re both slashers that to some degree deviate from the classic set up and in the case of Eyes of a Stranger its the 2nd half that is more of a thriller until the final act, which goes back to the slasher style and while I enjoyed the film for me the slasher aspect was by far the strongest parts of the film. There’s been a series of grisly murders in the Miami area and news reporter Jane Harris (Tewes) suspects the man that lives in the high rise directly across from her and begins to investigate while also looking after her sister Tracy (Leigh) who is a deaf, blind mute. The screenplay was written by Mark Jackson who apparently is actually Ron Kurz who wrote Friday the 13th Part 2 also released in 1981. The script is light on plot, which isn’t a problem when the film plays out like a slasher film, but when more of a thriller the lack of plot and with characters lacking depth does hinder the screenplay. There’s also a backstory that’s a nice attempt at adding some depth to the characters and plot, but it sort of feel like filler scenes and if they were removed it wouldn’t take away from the film at all. 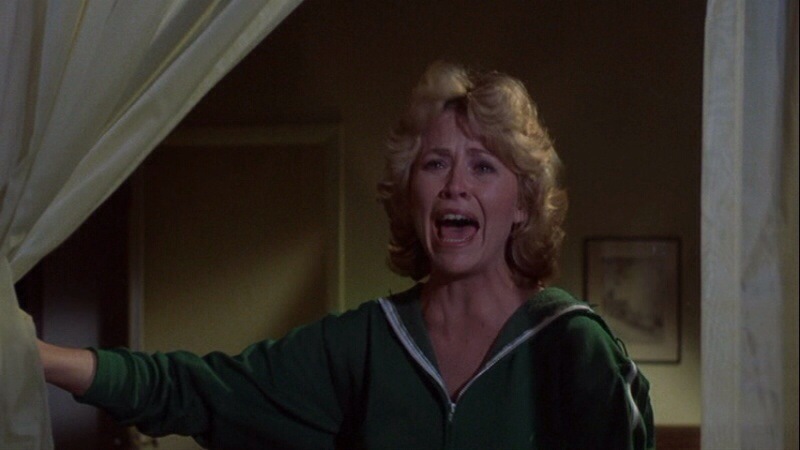 The script by Jackson (Kurz) again works well when the film plays off as a slasher, but I can’t help but think there was potential here for more that wasn’t fully realized. The script also sort of reminds me of a TV film by John Carpenter from 1978 called Someone’s Watching Me and while both are a bit different they also have a few things in common. 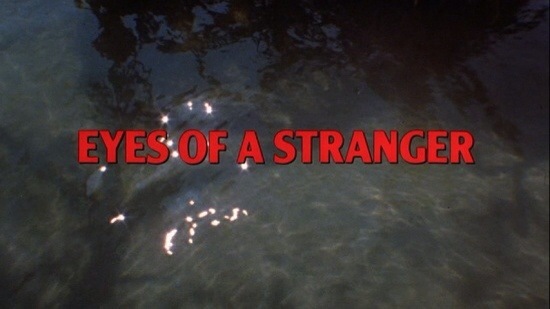 Eyes of a Stranger was directed by Ken Wiederhorn who also directed Shock Waves and Meatballs II and also directed episodes of such shows as 21 Jump Street and Freddy’s Nightmares, but he’s probably best known for directing Return of the Living Dead Part II. The production does feel more along the lines of a TV thriller only with gory murders added in. Eyes of a Stranger works best when playing up to slasher film conventions and while its nothing special, it is however effective with decent suspense, but the pace can be a little sluggish in spots when its more of a thriller as the script just isn’t strong enough to carry the film. The first half of the film is when its more along the lines of a slasher film and this is again when the film is at its best and the problems with Eyes of a Stranger are more in the 2nd half when the slasher aspect is downplayed and this is where the film gets quite sluggish though to no fault of Ken Wiederhorn as he makes the best out of a below average script. The final act however, Wiederhorn does get the film back on track and its back to being more of a slasher film again and while the final act isn’t the most tension filled scenes they are effective enough. The cast is fairly strong with Lauren Tewes (from the Love Boat) and a very young Jennifer Jason Leigh in her first starring role as prior to this she mostly had TV shows or TV films and if in a theatrical film a bit part. The following year would be Leigh’s breakout with the classic Fast Times At Ridgemont High. 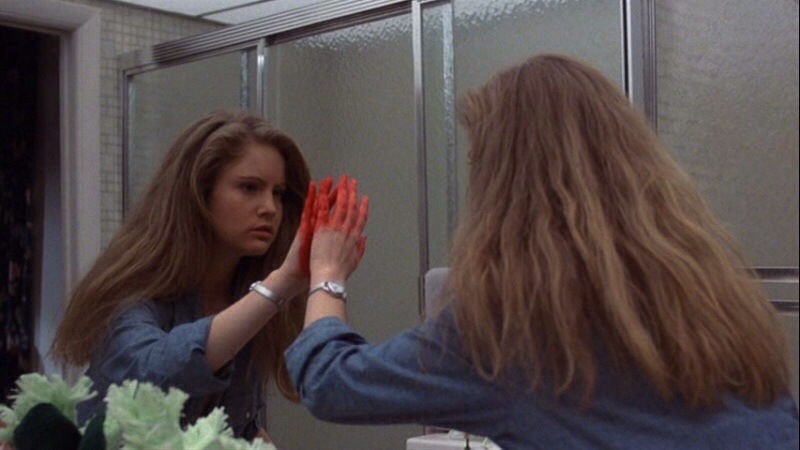 Tewes is very strong in her role, but too bad she’s sort of failed by the script and even though Jennifer Jason Leigh has no dialogue (well she does say one word at the end) she’s excellent and for me is not only one of my favorite actresses, but one I’d rate as one of the most underrated. The final act when the villain is chasing after her is wonderful and makes for a solid twist on Wait Until Dark. At this stage in his career Tom Savini was already quite legendary and he first made a name for himself in 1978 with George Romero’s epic Dawn of the Dead. But it was probably Friday the 13th in 1980 that really cemented his legacy and from 1980-1981 he worked on such films as Maniac, the Burning and the Prowler and Eyes of a Stranger is sort of one his more forgotten films and when compared to the films mentioned it isn’t difficult to understand why. While the F/X aren’t as graphic or creative they are however quite well-done and are effective and very much elevate the film to some degree. Overall Eyes of a Stranger is a solid watch, but works best when as mentioned playing up to slasher conventions. Nothing here really stands out from others like it, but they’re quite effective nonetheless. The 2nd half is when the film begins to run out of steam and again the script just wasn’t strong enough to carry the film as a thriller. At the end of the day though Eyes of a Stranger while not a great film by any means is enjoyable and slasher fans will probably find enough here to warrant a viewing.